Geek Grotto - Get Your Geek On! : Atlus And SNK Announce The King Of Fighters XIV Release Date!!! 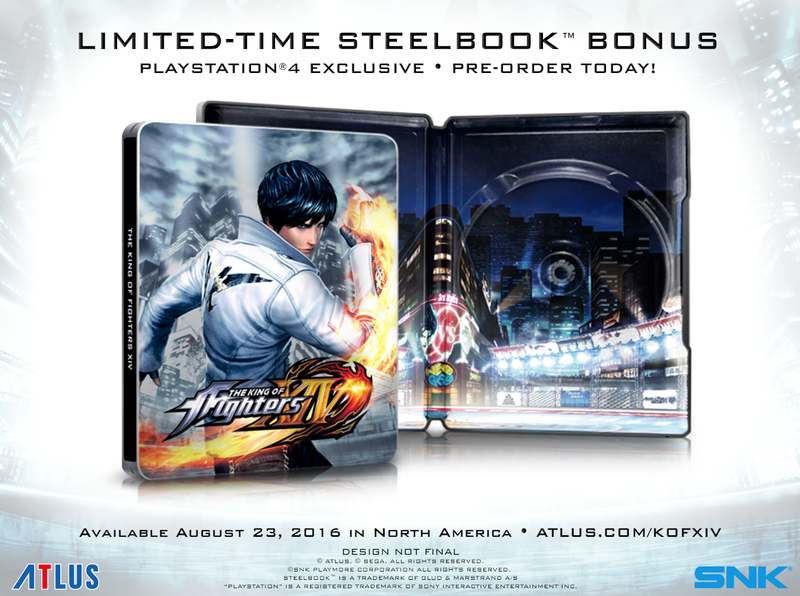 Atlus And SNK Announce The King Of Fighters XIV Release Date!!! No, that isn't a typo. SNK Playmore is now just SNK and with that, also announced that KOF XIV will land in the US on August 23 for the PlayStation 4! When initially announced last year, the game didn't look so well, but weeks and months later, the game looks great. While we do miss the traditional hand drawn 2D look from the previous 297 versions, it will not stop us from choosing one of 50 fighters to beat up others with! Also, a "Day One" edition will be housed in a Kyo designed steelbook and a classic Kyo costume will be available for the 1st week for free! 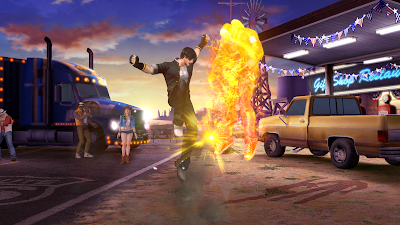 THE KING OF FIGHTERS XIV Launches Aug. 23 --Pre-order/Day One Edition Details Below! ...because ATLUS is creating a special Pre-order/Day One edition! 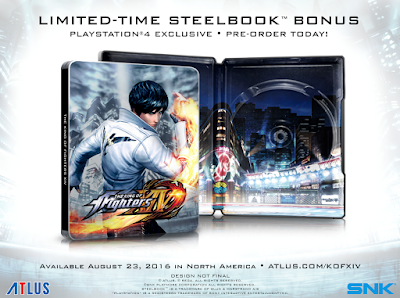 Only available while supplies last as a bonus item for THE KING OF FIGHTERS XIV is a collectible SteelBook™ emblazoned with the series' fiery mainstay, Kyo Kusanagi, literally burning to fight. It's the perfect collectible for fighting game connoisseurs who want to own a memorable piece of KOF history. But we're not stopping there (maybe you're not understanding the tagline "Burn to Fight!") 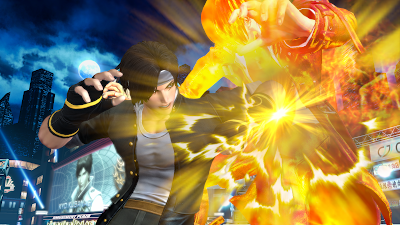 because Atlus U.S.A. is ALSO making the Classic Kyo DLC costume free for the week following launch as a download on PlayStation Network! Revamped Online Experience: THE KING OF FIGHTERS XIV has devoted a lot of development time to improving the game's netcode for vastly improved online gameplay. 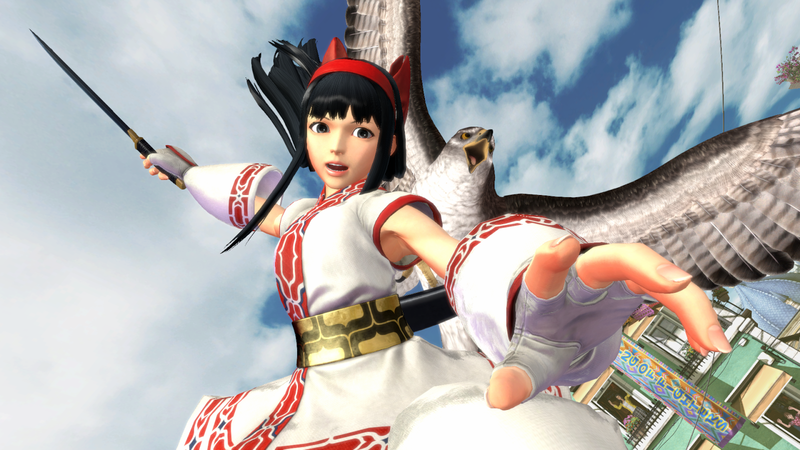 KOF XIV uses the PS4's online architecture to have a whole host of online conveniences, from spectating to saving replay/battle data, and having a single online KOF XIV profile to connect with friends. The game will be $59.99/CA$79.99 at launch.